In the late 80’s he became known as the author of several theatrical plays, after which Jeff Noon decided to expand his author’s horizons. Now they call him “the Godfather of cyberpunk”, as well as one of the key writers in the genre of science fiction in Britain. In the writer’s collection there are several theatrical productions of his works, one screen adaptation, as well as many novels, each of which can be called a cult classic. 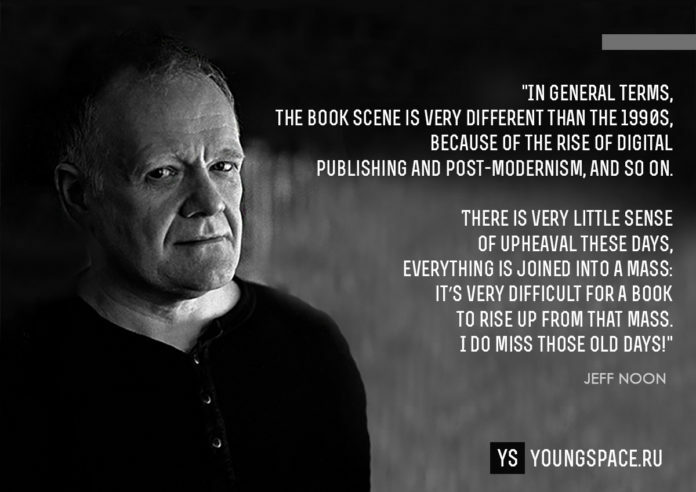 In an interview with Young Space magazine, Jeff Noon described how to perceive his first novels after years, about future work and his main goals as an author. — For twenty-seven years you have acquired a real cult status, in fact, becoming one of the key figures of alternative literature of the 90’s. Tell us, how do you assess the present stage of your work? – Well, I don’t read many books, these days, except for crime novels. I haven’t read a science fiction book in many years, so I can’t talk about the contemporary scene in any proper sense. I imagine it carries on, seeking and sometimes finding news ways of talking about the world and its various futures. In terms of crime fiction, it seems to be in good health. I review crime books for a magazine, so I get to read a good wide range of new books, and there’s a fantastic range of subject matters and approaches on offer. Crime fiction is a very good way of tackling political subjects, for instance. In general terms, the book scene is very different than the 1990s, because of the rise of digital publishing and post-modernism, and so on. There is very little sense of upheaval these days, everything is joined into a mass: it’s very difficult for a book to rise up from that mass. I do miss those old days! — One of the most interesting things for the author is the theatrical adaptation. Can you say some words about working process ? Were you satisfied with the result? – I started out as a playwright. Theatre was my first love. I’ve written a few plays over the years, and hope to write a few more in the future. It’s always difficult adapting your own work from the original medium to another, a play from a novel, so I think, looking back, it might have been better if another writer had tackled the theatre play version of Vurt. I think it’s too easy for the author to get bound up with the original text and not want to change it, or, conversely, to think that it should be changed far too much. It’s difficult to find the correct balance. But I enjoyed writing the play, and working with the directors and actors on the production. Maybe one day, it will be put on again. I hope so. I would like to go back and take another look at the script. — Continuing the theme of «Vurt». The central symbol in your novel is a feather . First of all, it is a guide to the world of trip-dreams. However, does he have any more sacred meaning for you? Let’s just say, which has affected on your choice. – I wish I had a good answer for this one! So many people have asked me this question over the years. Sadly, there isn’t a great story to go with it, just hard work, imagination, a searching for ideas. I knew that I wanted a new method of ingesting the dream drug, not pills, not syringes or smoke or any of those usual things. I wanted it to stand out, to be different. The bird’s feather idea came about simply from thinking about people getting “high” on the dreams, and from the word “high”, the idea of birds flying around popped into my mind. And from there the feathers arrived. Many times in the creative process, inspiration takes charge; at other times, and equally importantly, reason takes over. One way or another, answers are found, ideas are generated. — Before our interview, you mentioned that you are working on a new novel. I’m as a fan of your creativity, I have to ask, could you open the veil of secrecy and say a few words about your future work? – I have a new novel coming out in August called A Man Of Shadows, from Angry Robot Press here in Britain. This is a science fiction detective story involving a city split into an area that is always illuminated, and another area of darkness, where the lights are never turned on. A private eye follows the trail of a lost teenage girl, a trail that takes him from the Day side of the city, into the Night side, and from there to Dusk, the mysterious and highly dangerous area that exists in-between Night and Day. I’m currently working on the sequel to that book, carrying the same private eye to another strange city, and another strange case. I’ve also just finished a crime novel, a proper murder mystery with no science fictional or fantastical elements. A bit of a first for me. But like I said, I only really read crime novels today, so this is a journey I’ve been wanting to take for a long while. — «Automated Alice» in Manchester future, Game Cat and many others. In your works there is quite a strong influence of Lewis Carroll. Tell us, what role did this author played in your life? – I read Lewis Carroll’s two Alice books when I was a child. But then later on, in my late teens, I rediscovered his work and saw it in a whole new light. I started to appreciate the hidden clues and codes in the stories, things that you don’t really see when you’re a child. I like the fact that it represents a very English, playful version of surrealism. And when I started to write SF novels, I naturally found myself putting in little references to Carroll’s work. So from there it seemed a very natural step to write a more explicit homage to Carroll. And so that became Automated Alice. I was a big fan of Martin Gardner’s book The Annotated Alice, in which he explains many of the hidden meanings in Carroll’s two books. One day I was looking at the cover of Gardner’s book and in my mind the title changed The Automated Alice. And then I saw a robotic version of Alice, a kind of Victorian Doll mixed with an android. So that vision was the start of the process of writing the novel: I wanted to find out what this automated Alice was doing, where she was going, and how she would interact with the human Alice. I really like the wordplay in Carroll’s work, the mathematical and philosophical games, the tricks, the secret messages. I just find all that fascinating. And as I’ve gotten older I also see a much darker side to the two books, which appeals to me now. So I think the books are endlessly inventive, and I can never get tired of them. But only Automated Alice really takes a direct inspiration from Carroll. My other novels are very different in feel, and in style, and are concerned with more adult themes. I think the spirit of Carroll will always be in my work, but mainly hidden away, below the surface. — The final part of the trilogy «Vurt» — «Nymphomation» came out after your break, which became «Automated Alice.» Was it difficult to «return to the roots»? – No, not really. I think I will always be able to find myself back into the Vurt world. I wrote three new stories a few years ago all set in that world, and I do have an idea for the final book in the sequence. I hope to get round to writing that one day. Recently, I’ve been working on the Vurt role-playing game with an American company, and that has been fascinating: seeing this world that only existed in my mind suddenly made available for everyone to make up their own characters and invent their own stories all set in the same realm. I really look forward to seeing what people come up, when they play the game. — Each author individually approaches to the work. What is your main criterion in the process of work? – To give pleasure to the reader. That’s my number one intent. To surprise the reader, with ideas, characters, emotions, etc. To create interesting worlds and themes that maybe haven’t been written about before. To explore the possibilities of language and storytelling, sometimes in an avant-garde manner, at other times in a more mainstream style. To write without rules. To explore the limits of story. — Your top songs «For All Time»?